Some of our frequently asked questions. Have question not listed? Get in Touch. The majority of our products are viewable online. However, if you can not see what you are looking for, please enquire as we are very likely to be able to source it. We can supply individual brand brochures on request for most of the range. Does the garment branding affect the Washing Instructions? Embroidered garments can be washed as per the washing instructions in the clothing label. If you are ordering online, there is an artwork upload area once you have completed your order. Our preferred formats are vector files and high resolution JPG, PDF. Generally, the higher the resolution or dpi of the artwork or photo the easier it is to work from, especially artwork with fine details. What resolution artwork do you require for different personalisation's? Low Resolution art: Is usually fine for embroidery designs (72 dpi) unless the design is very detailed or complex. A business card will do for some logos but detailed logos will need to be better resolution. High Resolution art: High Resolution art may be required for printing with a minimum of 300 dpi to avoid possible clean up charges Generally, the higher the resolution or dpi of the artwork or photo the easier it is to work from, especially artwork with fine details. Do I Receive a Proof Before Production? Yes, we always send proofs for your approval before production unless your order is a repeat design or simple name/text only order (by not proofing these orders we are able to speed them up considerably). Do you offer a free embroidery service? Yes. There is no set up charge on 25 garments and above with the same embroidered design. Set up fees on new orders, if applicable, are a one off charge to cover the cost of labour and administration. Typically a left hand chest size design costs £20.00. A more complicated or larger design may cost more. We will waive the set up fee on orders over 25 garments. Any digital files or screens remain the property Flying Colours and are not transferable. If you would like your logo file on a disk in embroidery machine format there is a charge of £20.00 plus VAT to release this. We don’t charge to set up simple text. How many colours can I have in my embroidered logo. You can have up to 12 colours in a logo. Can I see a free embroidery proof? Yes, we provide a free proof once the order is confirmed and paid for. Our proofs are done until you are 100% happy with them before going to production. I would like individual names embroidering as well as my logo. Is this possible? If embroidered individual names, nicknames or initials are required, at approximately 8mm to 10mm in height, in addition to your logo design, the charges are as follows: £2.50 + VAT per garment for up to 20 characters. Screen Printing is used primarily for bulk orders of the same design. Screen printing exposes an image onto a mesh screen. As the ink is pulled over the screen the fine holes in the mesh created by the exposure, allow ink to go through onto the garment to form the desired print. This is then passed through a dryer to cure (set) the print onto the garment forever. This method is ideal for simple one colour designs but can also be used for 2 colour, 3 colour and multi colours in substantial quantities. Quantities are required due to the considerable setup time of producing the screens and inks. Can we mix the order in terms of different colours, sizes and types of garments? Yes you can. 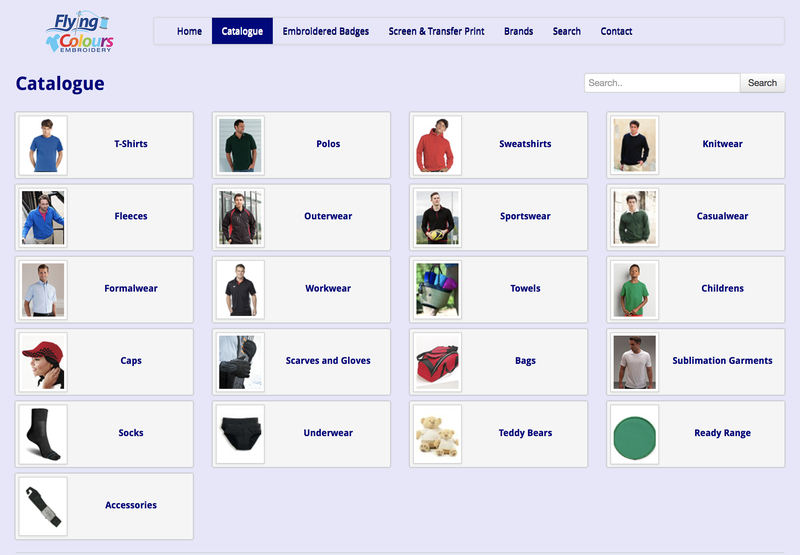 You can mix polo’s, T-shirts, sweatshirts and any other garments in our range. You can also have as many different colours and sizes as you wish at no extra cost. Are the garments good quality? Yes they are. To produce successful embroidery, we need good quality garments. We never compromise on garment quality. Our range includes (but is not limited to ) AWD, Papini, Cotton Ridge, Fruit of the Loom, Jerzees, Slazenger, Gildan, Ashworth, Glenmuir, Kustom Kit, Dickies, Henbury. We would like a special design and colour scheme for our corporate image. Is this possible? Yes. If you can’t see your requirement in our range, please contact us with full details – colour, quantity, etc – and we will try to source them for you. What if we require a large quantity of around e.g. 5,000 embroidered polos? We are pleased to quote on large quantities. Please contact us with full details at info@flyingcoloursembroidery.co.uk and we will get back to you straight away with a competitive quote. Our UK delivery is free of charge on orders of value £300 (ex vat) or higher. These prices do not apply to areas such as: The Scottish Highlands, The Channel Islands, Northern Ireland and the Isle of Man are based on weight..